So the first day has gone true to form. After send off speeches from the Minister of Tourism, the manager of the Shillong Club and the ever laid back Matt of The Adventurists we follow a vintage silver Jaguar out of Shillong. 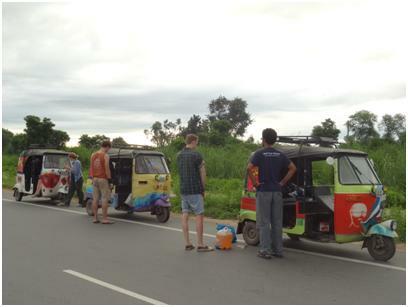 We pass the first tuk tuk about 500m down the road, who have run out of petrol. We top ourselves up at the next petrol station. All good and breezy, mostly downhill with a fair amount of traffic and belching trucks, with some nervous jitters we negotiate our first overtake manoeuvres, get our ears tuned in to the horn we are on our way! About 30km later we have our first breakdown, Tukkenham Hotspurs has developed a curious occasional clunk with a strong pull to the right. Another couple of kilometres and all forward movement halts. Enter Tuk Gear with Rich and Brett to the rescue. They have hijacked Team Canada’s onboard local mechanic, Kyntiew, who is very friendly not that good a mechanic but a better one than the rest of us. Eventually a sheared bolt in the back right wheel hub is found, removed and we are on our way again. The one and only rule we have made for the Rickshaw Run – no driving at night – is soon broken. We arrive in Guwahati after dusk in rush hour, dust, dirt and horns, searching for a hotel and breaking another rule – no driving into oncoming traffic up a dual carriageway! Hotel found, we collapse into bed. Not a bad day considering two other tuk tuks have rolled. The next morning packing up our tuk tuks local reporters accost us from the television station, DY 365. Can we give an interview for the evening news? No problem we reply and we are whisked off to the television. Dave and Andy give an ‘in depth’ analysis of the why and wherefores of the Rickshaw Run, not forgetting to give FrankWater an honourable mention. A half an hour later we are chased down on the motorway by pursuing cameraman for ‘live’ footage of the Run. We are also reliably informed Tuktanic and Laura feature in today’s Assam Times.